Drawer Liner Chest Keyed Lock Ball Bearing Slides Steel Black Rust Resistant. 6-Drawer Chest is great for storing and organizing all your tools and hardware. The chest is made from high grade all welded steel construction and finished with tough industrial black powder coat paint. 6-Drawers and easily accessible top till provide a total of 9,788 cu. Drawers are all full-extension and glide effortlessly on ball-bearing slides that can support up to 100 lb. These slides also have a unique Secure Latch retention system that ensures your drawers are completely closed and secured. The reinforced top lid is supported by gas struts which make it easier to open and close. Recessed aluminum side handles make it easy to lift and move the chest around your work space. Charge your tools even while the chest is locked with integrated power strip featuring 4 outlets and 2 USB ports. 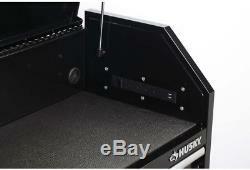 The chest also has an internal keyed locking system, with 2 keys provided, for added security. Drawer dimensions: 3 left drawers: 20.6 in. W x 15.7 in. D x 2.9 in. H; 3 right drawers: 13.8 in. Full extension ball bearing drawer slides support up to 100 lb. And feature secure latch retention system that ensures your drawers are completely closed and secured. All welded steel construction with a tough, rust-resistant powder coat black paint finish. Top till is made easily accessible by opening lid, which is supported by gas struts. Internal keyed locking system (with 2 provided keys) provide added security. Integrated power strip in till features 4 outlets and 2 USB ports. Premium drawer liners are included. Nominal Width: 41 Product Depth in. : 17.8 in Product Height in. : 23 in Product Width in. : 100 Features: Ball Bearing Slides, Lid Gas Struts Frame Steel Gauge: 21 Grade: General Purpose Holding Capacity cu in. 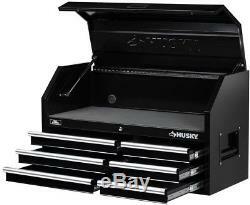 : 9788 Included: Drawer Liner, Keyed Lock, Power Strip Material: Steel Product Weight lb. : 104.3 lb Returnable:30-Day Tool Chest Size: Medium Tool Storage Product Type: Tool Chest Tools Product Type: Tool Storage Weight Capacity lb. Our stock all ships from our US based warehouses. Because of the efficient manner of our ordering system, orders placed cannot be canceled an hour after they are made. NO APO, FPO, DPO, Or US territories and protectorates. Rectango wants you to be completely happy! When we receive your package we will process the return within 72 hours. We do our best to process as quickly as possible. We guarantee that your issue will be solved quickly. We usually respond within 24 hours on weekdays. The item "Drawer Liner Chest Keyed Lock Ball Bearing Slides Steel Black Rust Resistant" is in sale since Sunday, April 22, 2018. 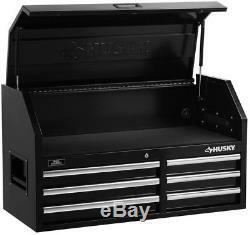 This item is in the category "Home & Garden\Tools\Tool Boxes, Belts & Storage\Boxes & Cabinets".homeimprovement" and is located in Miami, Florida.